Club N Caldes: Building scenery, last work of the year. 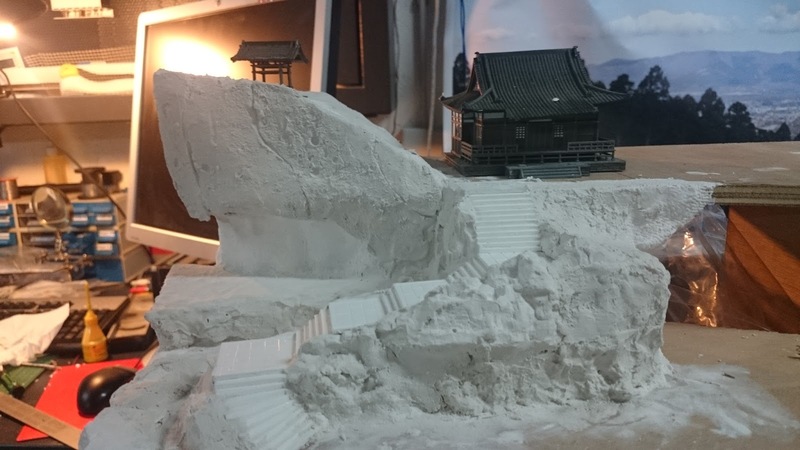 Building scenery, last work of the year. Finally, is time to start building scenery. Track has been tested and works everything ok. 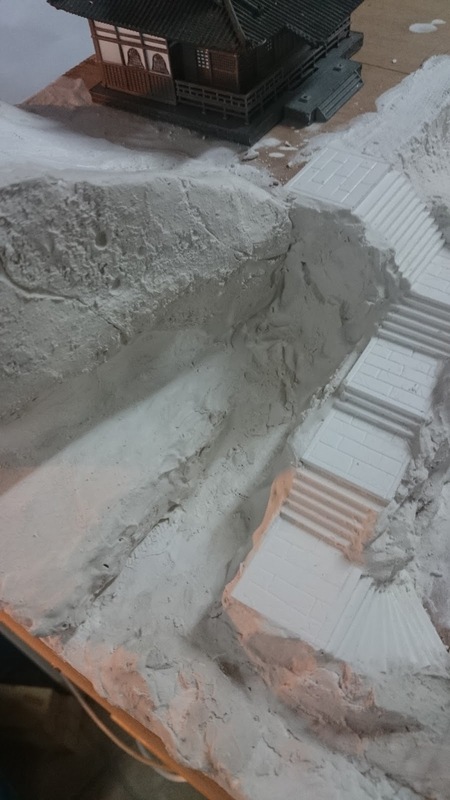 I plan to start building all the scenery of the upper part of the layout, from top to bottom. I had in mind to try to reproduce Yamadera (山寺) which is a temple complex sited in Yamagata prefecture. I was there in Spring this year, and for me is the most beautiful and charming place in Japan despite there are many other places also with a magnificent atmosphere like Osore-Zan. And some more I found on internet to see also the color of the rocks from the other side of the temple. 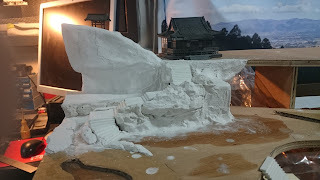 Shape will be different due to the place I have in the layout, but I want to keep the essence of the place so anyone who has been there can recognize it in my layout. Temple buildings will be also different, as I'm using the Tomytec temple set and not scratch building them. The 2mm steps are a little bit out of scale, but using 1mm PVC foam was too much work and I would have needed 1000 steps as the real temple!! Now wait until it's completely dry and do not try to paint it until next day. For painting I used a mix of different techniques. Some airbrush painting I already know from my plastic models experience, and others taken from Woodlan Scenics or some friends who have experience with scenery. 2) There is a zone made with concrete, not natural. This has been also airbrushed in a concrete color. Using some variants of ocher also all the rocks have been slightly airbrushed. 3) Now I changed of technique, using the "Leopard Spot" and the Earth Colors from Woodlan Scenics. You can find very instructional videos in their web site, but basically you tint with diluted colors (proportion 1/16 or a little more) 1/4 of the rock for each color. This is in case you are using 3 colors for this first step (white, concrete and ocher) like me, and leave 1/4 with no paint. If you are using 2 colors, then paint 1/3 of the rock with each. 4) Second step of the "Leopard Spot" technique is to wash the entire surface of the rock with a predominant color, in my case Raw Umber as I feel this is the most similar color of Yamadera rocks in general. In this case the paint has to be diluted in double proportion than the previous, 1/32. 5) I still wanted some more contrast, so I decided to make another wash with Slate Gray. Black is too much strong for the rocks I'm modelling. I had to dilute strongly this color, a proportion like 1/50 or maybe more. At the same time I was applying the was I was removing the excess with a kitchen towel paper, turning the edges of the rock in a much more clear color. I liked the final effect, so no dry brush technique was used. Merry Christmas and Happy New Year!!!!!!!! !